The Gahan Brewery is releasing their IPA in bottled form, starting this weekend. So says their Twitter feed, anyway. If you're looking to sample it, free samples will be available at the pub as well as local liquor stores this weekend. I'm curious to see how the finished / carbonated version comes out... their IPA used to be mediocre, was, in August, pretty great, then, soon after, just OK (due to a malt and hop change), and now, on tap, is still OK / good. Hopefully the inconsistency will get sorted out. Ideally, what was getting done in August should be replicated and saved as their staple IPA. We'll see. When I get a bottle, I'll review it and let you know. I was happy to hear this on Twitter... I definitely prefer the IPA (the couple of times I've had it, anyway) to the other two beers that they've been bottling. I just read their latest twitter, and they also mentioned Iron Horse was available in bottles as well: "Big DayToday-1772 IPA and Iron Horse Brown available in stores today!" Yep - picked one up Friday. I just didn't drink it yet. I should have a review of bottled versions of both (may also come with a brewery visit) up within a couple weeks, for sure. Based on the bottling, things are going in the right for the Gahan House.......quick question......have seen any products from the new PEI brewery that had a booth at the PEI Beer Festival? Yes, Gahan is getting some good things going. Unfortunately, those at the top are still a bit more concerned with bucks than brews, though... hopefully in time both can coexist. It's been quiet on the Barnone front since Sept. I'm hoping they'll still get into restaurants/bars this winter (sooner than later!). Excellent beers! Specially the Island Red we want to export to Europe since August, we have high demands here for that type of beers, but the brewery does not look ready for.!!! That's a pity!I did visit them in August in Charlottetown. 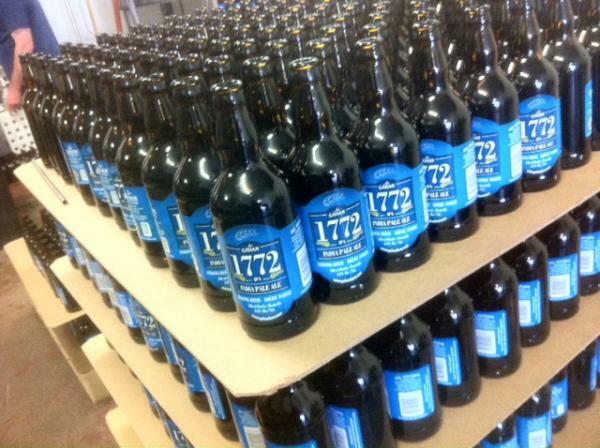 The Liquor Commission of PEI is motivating us to export these beers. So when? Send us a fax to : 001-613-248-5180 or call us in Europe to : 011-31-641-477-193, talk to you soon!